As you will have probably noticed East Devon is a bit of a salmon desert but there are sea trout to be had from the Axe and Otter. If you haven't found your way around these yet I'll PM you with a bit of local info. Hello Sinktip...and a big hello to all members who read this post. I am a forty something male with an obsessive interest in Salmon fly fishing. I have been looking at the discussions on this forum for a while now and felt it was time to take the plunge, so I have now registered. I have noticed that the information and advice posted on the forum seems impartial and that each contributor has something to offer in the way of opinion advice or to generate discussion. The fly tying tips and advice are of interest to me, since I tie all my own efforts, and I like the tackle discussions since they sometimes offer opinions/insight into rods,reels and lines etc. which others have purchased or used. I take heart in the free exchange of ideas and info I have become used to on the forum and look forward to giving my own views on some of the topics up for discussion in the future. I shall endeavor to try to keep any posts/responses I make as light-hearted, factual and to the point as I can make them. Yours sincerely, Hugh Mccann Hello Sinktip...and a big hello to all members who read this post. I am a forty something male with an obsessive interest in Salmon fly fishing. I have been looking at the discussions on this forum for a while now and felt it was time to take the plunge, so I have now registered. Where are you from and what rivers do you fish. Welcome dragonfly64... glad you've already enjoyed the forum. Hope you find something of interest, and to stimulate you to post a wee story or two, fishing experiences, questions on tackle / tactics / rivers / beats. Feel free to post your views, new flies, and any pics you have of places fished. ps.....'1664' ....must be time for a beer! Hello Chalmers et al. James, I aint got no English 'O' level or Highers, simply try to avoid the vernacular which you and a few others seem so adept at using in your posts. I'm looking forward to joining in by making a post or two of my own but for the meantime will sit back and see how the experts get on. Dunno what you mean by the DUPLICATE?? but assume you refer to my posting same message twice?? am not up to scratch with posting as yet but given time will improve. Hi Hornet, as both Buckfastvalley&Speyvalley have guessed it I am from Kirkintilloch, Central belt. I have fished all over for both Trout and Salmon but most of my recent time has been spent on the Teith, Tummel, Dee and the wee river Allan in Stirlingshire. 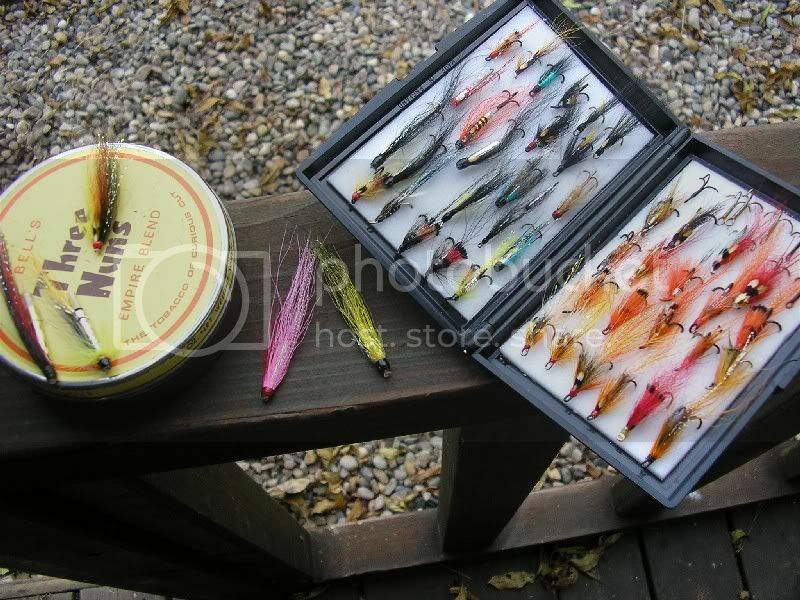 All of my fishing now is done for Salmon/Sea Trout with fly. I like/prefer the double hander (although Mr Chalmers would tell you or anyone else for that matter that I tend to only use one hand to cast with a double handed rod) for bigger rivers and am trying to perfect my casting ability so that I can put out a longish line consistently. Hi Buckfastvalley, ta for the welcome. I won't admit to being 'mad', but I am from Kirkie. awright shug, its Iain here. has James worked out how to register here yet? Hi Iain-G, thought that Buckfastvalley was reminder of North Lanakrshire area. James has registered but has not got a clue how to post messages. Will have to give him some advice or show him how it's done. Hello Greyhead - What our resident bard James is saying is welcome to the forum where knowledge and affection operate in tandem, where tales of yore, oral history and modern myth "live together in perfect harmony - side by side on my rod rack Oh lord let's go fish the Dee" (McCartney). ps - Yo ! Adriany (even newer member) - whits yer bag loon - c'mon noo, oot wi it ? welcome to the number one salmon fishing forum at last james. I noticed earlier in this thread he was giving a 108 year auld man,a very warm welcome.